Fat Strike. Muscular Definition. Increases Metabolism. Promotes Alertness. 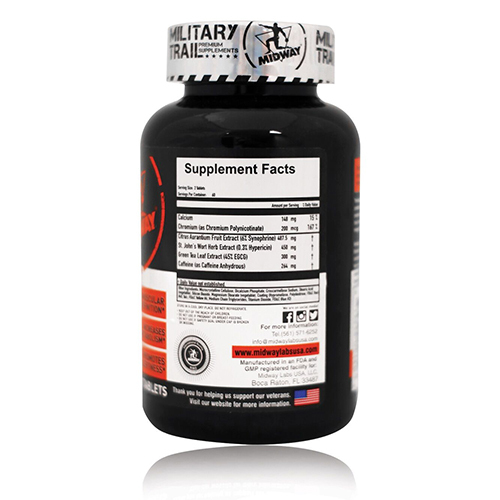 Thermogenic Blast is an advanced formulation designed to help increase metabolic rate and promote thermogenesis when combined with diet and exercise. This promotes fat loss while preserving lean body mass, while supporting a reduction in abdominal fat for that "ripped abs" look. In addition, Thermogenic Blast may help you feel fuller when you eat and help increase energy levels, enhance performance, promote alertness and reduce fatigue. Take 2 tablets twice daily. Taking more than the recommended amount will not improve results and may cause adverse reactions listed in warnings. Microcrystalline Cellulose, Dicalcium Phosphate, Croscarmellose Sodium, Stearic Acid (Vegetable), Coating (Hypromellose, Polydextrose, FD&C Red #40, Talc, FD&C Yellow #6, Medium Chain Triglycerides, Titanium Dioxide, FD&C Blue #2). This product is only intended to be consumed by healthy adults 18 years of age or older. Before using this product consult with you physician if you are using any prescription or over the counter medication or if you have any pre-existing medical condition including but not limited to: high or low blood pressure, cardiac arrhythmia, stroke, heart, liver, kidney or thyroid disease, seizure disorder, psychiatric disease, diabetes, difficulty urinating due to prostate enlargement or if you taking a MAOI (Monoamine Oxidase Inhibitor), SSRI (Selective Serotonin Reuptake Inhibitor) or any other medication. One serving of this product contains about 300 mg of caffeine, about the amount typically found in an 18 oz. cup of the premium coffee house coffee. Do not combine with other sources of caffeine (i.e. tea, coffee, cola beverages and energy drinks). Too much caffeine may cause nervousness, irritability, sleeplessness, rapid heartbeat or other conditions in some individuals. Discontinue use and consult your health care professional f you experience any adverse reaction to this product. Do not exceed recommended serving. KEEP OUT OF REACH OF CHILDREN. Store in a cool, dry place. Do not refrigerate. Do not use if pregnant or breast-feeding. Do not use if safety seal under cap is broken or missing.